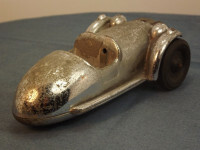 This model is the Castle Art Gaiety Toys Morgan in a chromed metal finish. This a clockwork model but has no key. 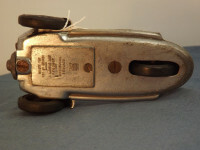 The model appears to be a three-piece metal body, 122mm in length. 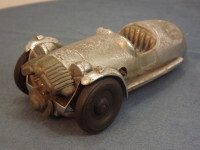 It has been molded with representations of the grille, engine, lights and a manufacturer's logo at the front, an exhaust pipe on each side of the body, a solid windscreen, and a cockpit with steering wheel (missing) and seat. There is no glazing. 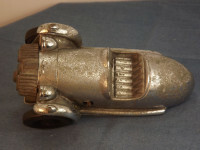 The two front wheels are solid rubber and teh driving wheel from the clockwork motor also appears to be a hard rubber. The base plate formst he lower part of the toy, including the exhaust pipes, and is marked with "Gaiety Toy, Reg. No. 850429." on the first two line, then comes a solid line, then "A Castle Art, Product" on the next two lines, followed by another, shorter, solid line, and then "Birmingham, England" on a further two lines, and finally "Trade [Castle image] Mark" on the last three lines. This model casting has been chrome plated rather than polished as evidenced by the chrome corroding on the body. I do not know when this item was issued but believe it to be circa 1935-39.